The Venitian edition of 1497 is little different from the two preceding ones. In our ignorance concerning the name of its author, diverse hypotheses have been put forward, including that of Francesco Pellati (1932, p. 123 sq.) who believes he sees there the hand of Fra Giocondo, an assertion as undemonstrable as those proposing the names Vittor Pisano or Giorgio Valla. The printing location, the name of the printer and the date are on the other hand clearly stated at the end of the volume : Venice, Simone Bevilacqua from Pavie, August 3rd 1497. The following formal changes were made to the Florentine edition of the preceding year : the number of chapters in book I is not the same (six instead of eleven) ; it is rather frequent, this time, that Greek terms are kept, not transliterated, even if the epigrams of book VIII are still not transcribed ; finally two new figures appear, one at the end of the first chapter of I (exactly in I, 1, 16), which endeavors to give an idea of the compatibilities among the astrological elements and musical chords (squares, trines, fourths and fifths), and the other one which, at the end of the first chapter of IX (in fact IX, praef. 5), takes the place of that of the preceding edition. It presents, awkwardly, the way to construct triangles, each with a surface area of fifty feet according to the Platonic method. The figure of IX, praef. 8, already in the 1496 Vitruvius, is moreover needlessly complicated. The impression we have from these graphics is that the author overestimated his ability in geometry. From the point of view of the text, a few rare lacunae still present in the Florentine edition have been filled in, as in III, 5, 2, in which the publisher adds, after “superior torus” : “quartae, reliquae tres aequaliter dividantur et una sit inferior torus”, as the manuscripts require. Lucia Ciapponi has also pointed out several hypotheses, some rather felicitous, like immania (pondera) in II, 9, 10, instead of inania which rendered the sentence incomprehensible. Therefore, we cannot deny that, like the second edition, this one does not simply reproduce the princeps edition ; some changes emerge slowly in the transcription, and consequently in the comprehension of the text. The fact remains that the absence of any pedagogical or operative perspective allows many obscure passages to remain ; most would be dispelled thanks to Fra Giocondo’s work. Identified by Vladimir Juren as having belonged to Guillaume Budé, the copy in the Bibliothèque nationale de France presents great interest, because it has numerous interlinear and marginal annotations as well as sketches signed by the great humanist. Juren was able to establish that they had been carried out from clarifications and advice brought by Fra Giocondo while he stayed in Paris, during the first years of the 16th century. Previously it was admitted that Budé’s praise of Giocondo in his Annotationes in libros Pandectarum (fol. 85r°), presenting him as a very great specialist of antiquity (“hominem antiquitatis peritissimum”), and the best interpreter of Vitruvius, not only thanks to his readings but also by means of his drawings (“graphice quoque, non modo verbis”), comes close to rhetoric, even if L. Ciapponi in her 1959 Milanese thesis had already noted in general terms that the first was dependent on the second. The irrefutable demonstration by V. Juren showed that it was simply a question for Budé to recognize the debt he had incurred with the Veronese monk during fruitful conversations he had had in Paris with the one he calls his excellent master (“praeceptorem eximium”). But the scientific and historical contribution does not stop there, since it also allows us to make out indirectly the state of progress in Giocondo’s thinking on the De architectura, at a little less than ten years after its publication in 1511. Moreover, contemporaneous with the reconstruction of the Pont Notre Dame (which collapsed in 1499), Budé’s notes and drawings probably reflect some of the machines used on that ocasion ; Giocondo was familiar with the development of these machines. In fact, at the end of book V (V, 12, 5), in the margin of a text corrected acording to Giocondo’s speculation, we read a description of the machine designed for raising water (cochlea, tympanum), with a drawing that seems to anticipate the woodcuts which would illustrate the passage in the 1511 edition with, moreover, at the bottom of the same page, this notation : “Rotae aquariae sunt illae quibus usi sunt in ponte parisiensi ad exhauriendum aquam quae equis rotabantur”. There are many speculations and additions in the text and its margins attributed to Giocondo, and V. Juren has listed them. Let us mention simply, in I, 5, 3, talae for tabulae with a drawing, sketchy, which calls to mind the one in the 1511 Vitruvius (fol. 7v°), in III, 2, 6 Hypethros (instead of Hypaethros) for Hypteros, with various sketches- one of which is the plan of a pseudodipteral temple, fairly ill conceived, but with a correct attic base, in III, 4, 5, lysis for laesis, and barely legible today, scamillos for scabellos, with, below on the right, an inept but effective sketch of a temple on a podium reached by a flight of stairs on the façade. In III, 3, 12, a drawing is placed crosswise to the text, of a rather meticulous Corinthian column placed on a quadrangular pedestal defined as the stylobate, as in folio 28r° ; in IV, 2, 1, the illustration of the difficult passage on the roof structure of the attic quoted in the Pandectes, which heralds, with the names of the elements of the system, the woodcuts in folio 35v°, etc. 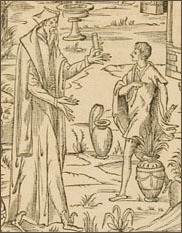 Sometimes, Budé’s interpretation of the graphics is not the same as Giocondo’s, later, as for example III, 5, 3, where the word astragalus leads the French scholar to place an astragal in its literal sense on his Ionic base, with its beads and small convex disks, unlike what we will observe in folio 29r°. But it happens rarely, to tell the truth, that Budé understands the text of the incunabulum better than the scholarly monk ; thus in V, 1, 6, he proposes an internal colonnade for the Basilica of Fano, which corresponds to the Vitruvian description, whereas it appears in folio 46v°, absurdly, with an exterior peristasis. Therefore, on Giocondo’s advice, it would seem that Budé eliminated in book VII, by crossing out, the interpolations which weigh down chapter 6 on the marbles, and which come from an inversion in the order of the folios. The 1511 edition, like most of the subsequent publishers, would do the same thing. Finally, let us note that if it is not always easy to decipher the comments in the margin, we find hints of some of the most characteristic aspects of the method that Giocondo would use to prepare his own edition. In this respect, references to numerous Latin authors are significant, in clarifying such and such technical term (Cato, Varro, Caesar, Titus Livy and Columella) or references to certain early modern ones (Leon Battista Alberti and Giovan Battista Pio, among others). L. A. Ciapponi, “Fra Giocondo da Verona and his edition of Vitruvius”, Journal of the Warburg and Courtauld Institutes, 47, 1984, p. 88 and appendix IB. L. A. Ciapponi, “Agli inizi dell’umanesimo francese : Fra Giocondo e Guglielmo Budé”, Forme e Vicende. Per Giovanni Pozzi (Medioevo e Umanesimo, 72), Padua, Antenore, 1989, pp. 101-117. V. Juren, “Fra Giovanni Giocondo et le début des études vitruviennes en France”, Rinascimento, ser. 2a, 14, 1974, pp. 102-116. F. Pellati, “Vitruvio nel Medioevo e nel Rinascimento”, Bollettino del reale istituto di architettura e di storia dell’arte, 5, 1932.